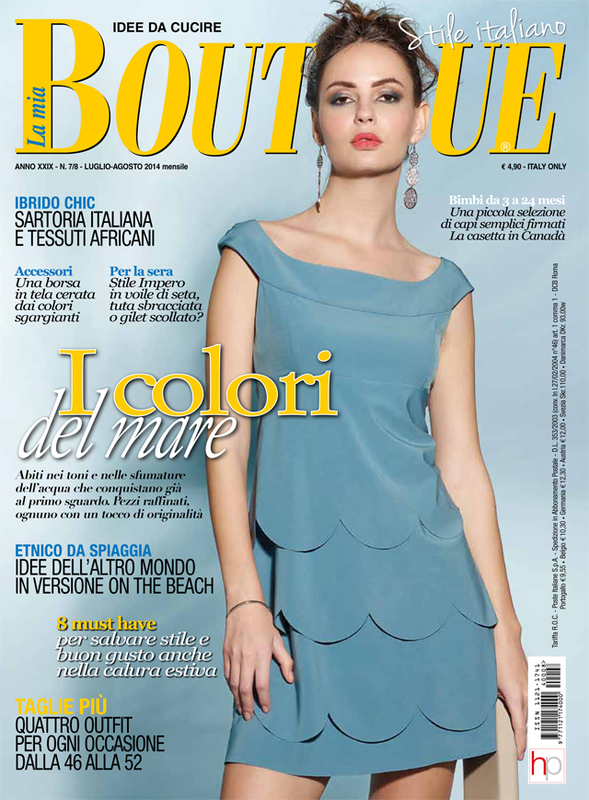 A new La Mia Boutique issue is here! The scalloped dress on the cover look lovely though I worry it would be a nightmare to cut those scallops so precisely. Indeed it’s an advanced pattern…correctly so. E’ uscito il nuovo numero de La Mia Boutique! Il vestito della copertina è delizioso anche se forse sarebbe davvero complicato tagliare le curve in modo preciso. E’ un modello per esperte…forse per questo! As you may know by know, La Mia Boutique garments are not actually made by their staff. They select designer garments and then create the patterns. So what you see on their pages are actual garments you can find in the stores. So…I am really surprised to see that design placement isn’t as perfect as I would like it to be! Having said that I really like the pattern…you wouldn’t be able to wear a bra but I could definitely see myself wearing it. Forse lo sapete già…La Mia Boutique non realizza i vestiti usati nella rivista. Sono abiti di designer e lo staff crea i modelli. I modelli che vedete sono in vendita nei negozi…per questo motivo sono sorpresa di vedere che il disegno su questo vestito non sia piazzato in modo impeccabile. A parte questo…il modello in sé mi piace. Anche se non potrei mettere il reggiseno ma mi piacerebbe farne uno. Oh…I love the fabric on this dress. Not a fan of strapless dresses but you could easily add a tie from center front to the neck. La stoffa di questo vestito è meravigliosa. Non mi piacciono i vestiti a fascia ma sarebbe semplice aggiungere un laccetto da annodare intorno al collo. Jumpsuits seem to be the newest trend. I am not sure I would sew one myself, but I find it looks nice on the model. Sembra che le salopette siano l’ultima moda. Non credo la cucirei per me, ma mi piace sulla modella. Isn’t it incredible how you can easily change a pattern with subtle modifications? The collar and the center front seam left open easily allow you to add a twist to a pattern you already have. Trovo incredibile come con piccole modifiche si possa cambiare un modello. Il colletto e l’apertura sul davanti consentono di cambiare in pochi passi un modello che abbiamo già. Along the same lines…are the following two patterns…a detail on a tank top and fabric cut on the bias for the skirt allow you to use a TNT pattern and make a whole new garment. Sulla stessa linea questi due modelli: un dettaglio sulla maglietta e la stoffa tagliata in sbieco per la gonna e un modello che avete già fatto e che veste bene diventa tutta un’altra cosa. Again…a woven tank top with a few modifications and there you have a new top…I really like this idea! E che ne dite di questo top? A me piace molto. These patterns come in larger sizes. The blue dress reminds me of Pattern Magic books…just easier to make! And the tank dress is just a simple pattern included as a variation…you could easily make it in a bold print without disturbing the actual fabric design. Questi modelli sono in taglie fino alla 52. Il vestito blue mi ricorda i modelli dei libri giapponesi Pattern Magic ma più facili da fare! E la scamiciata è una variazione…la vedrei bene con una stoffa grafica che consentirebbe di non distorcere il disegno. Yeah for shirt dresses! I would lengthen it but you could use it as drafted as a beach coverup! Mi piacciono molto i camicioni! Allungandolo lo metterei di giorno e in versione corta come copricostume! Last but not least! Children patterns! I usually don’t review children wear as I am a selfish seamstress 🙂 But this issue is very special! 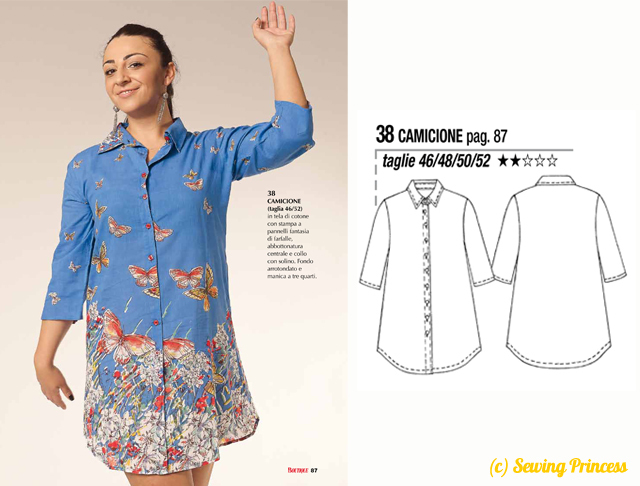 For the first time La Mia Boutique let an Italian sewing blogger (La Casetta in Canadà) design their patterns and used trendy fabrics (Liberty and Atelier Brunette) available online in Italy at Supercut! And even the styling is a lot more modern. Don’t you think? 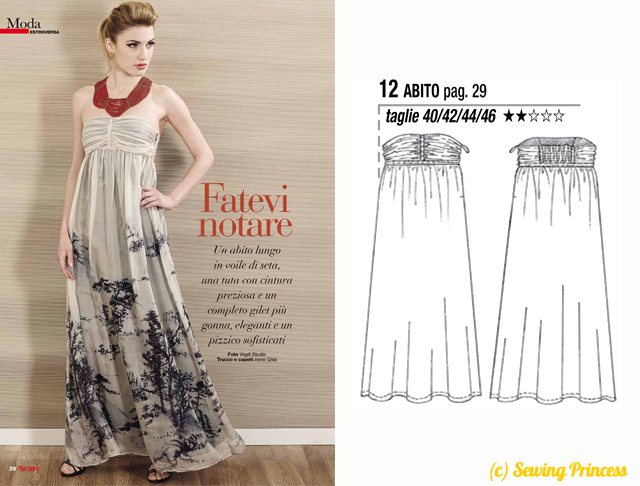 I am really excited about this…Personally I would love to see at least some original patterns drafted by La Mia Boutique staff. Would you? E in ultimo dei modelli per bambini! Come sapete di solito non li includo perché sono egoista e cucio solo per me 🙂 Ma questi sono particolari. Per la prima volta La Mia Boutique ha fatto disegnare i modelli da una blogger italiana (La Casetta in Canadà) e ha usato delle stoffe moderne di Liberty e Atelier Brunette che sono vendute in Italia da Supercut! Anche la fotografia è più moderna. Che ne dite? Sono molto contenta di questo sviluppo…Personalmente mi piacerebbe davvero se alcuni dei modelli de La Mia Boutique fossero disegnati dallo staff della rivista. E voi? Yay for a new LMB issue! I really like some of the patterns this time, particularly the jumpsuit (I’ve wanted a jumpsuit ever since last summer, but my one attempt so far hasn’t really worked out) and the plus-size patterns. Too bad I’m not a plus-size lady. This shirt dress and Grainline Studio’s Alder pattern have already almost convinced me of a non-fitted shirt dress. I might have to try a pattern hack for that. 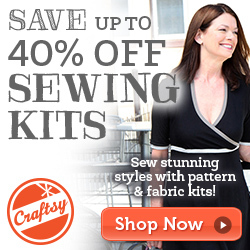 I agree that it’s fun to see some original patterns, designed by a sewing blogger! I would prefer adult clothes, since I don’t have any children to sew for, but perhaps that’ll happen at some point (the adult patterns, not the children!)? This is a great issue! That shirtdress would be great as is with leggings, or a smidge shorter with slim legged trousers. The floaty maxi is gorgeous too. I do love these reviews. Thanks for the review! I didn’t see many styles that interested me, except for the jumpsuit — would love to make one!